PAT also known as Portable Appliance testing is a way of ensuring that all electrical appliances are well maintained and are not going to be of risk to employees. Portable Appliance Testing, although not a legal requirement, ensures the safety of those who use the equipment. Many insurance companies will require that all electrical appliances are tested frequently to reduce the risk of accidents due to faulty appliances. 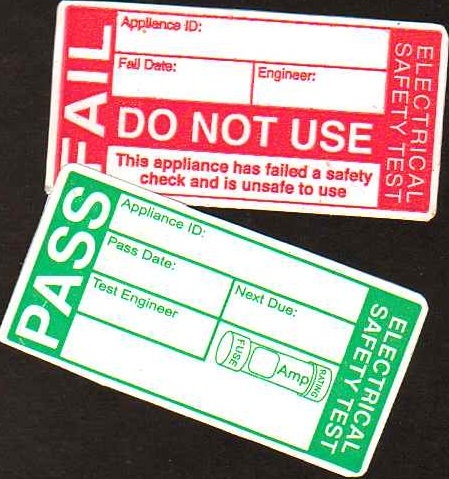 All appliances tested will be issued with a sticker showing whether it has “Passed” or “Failed” along with a retest date. If any appliances do fail the PAT then the employer is notified so that it can be dealt with in order to prevent any accidents in the workplace. If PAT is not carried out, both you and your employees could be at risk of using faulty appliances. Faulty appliances can cause fires & injuries to personnel using the appliances. 25% of Electrical Accidents involve faulty Portable Appliances. We can approximately carry out PAT on up to 350 items in one day. However if there is a need for a specific time scale, we will be more than happy to help meet your requirements. We will come at convenient times for you, whether this be during working hours or not. We also reduce the time taken to perform the testing by using a Metrel PAT tester, this will mean less disturbance to you and your employees. It also enables us to provide you with the Information gathered and Certification in Paper/ Email and Compact Disc format, to suit your needs as a company. At A Coole Electrical we provide competitive prices for all of our electrical work including our Portable Appliance Testing. Our PAT Prices start from just 64p per item. If you would like any further information or a FREE quotation then please contact us here.